Borg, on the other hand, is soft-spoken. He lacks emotion. He is very particular about his play and his fame, which he actively avoids. He is the apparent antithesis of McEnroe in almost every respect. Except, of course, that they both play a mean game of tennis. It is a quote meant to setup an examination of the identity of a tennis champion and how a single match can replicate the rise and, perhaps, the fall of a champion. The two players of the film’s title analyze each other, break down the emotional complexes of each other’s game. By the time they face off, they know what makes the other tick. When the film focuses on this rivalry, on the two leads eyeing each other down and making inferences on the other’s psyche, it is at its most intriguing. Much of the film, however, is cluttered with flashbacks that pad the runtime. Some of these flashbacks add to the intrigue of the former, providing insight on the two characters. Others lay out a more standardized sports biopic story arc. They includes an inspirational coach speech that inspires a dramatic 180-degree shift in a character’s playing ability. They include an over-bearing parental figure. They include basic trials and tribulations of the up-and-coming sports figure. When the film actually gets down to it, though, the rivalry is a compelling thing to watch play out. The quick flashes of tennis that we see leading up to the finals are edited in a way that is disorienting, lining us up with the intent thought process of our two figures. Metz puts us in the heads of the characters wonderfully in these scenes. And that final match, what the entire film is building towards, is well worth the wait. After the brief glimpses of matches that we have seen up to this point, the extended climactic game feels labored with tension by comparison. It is undoubtedly gripping. The two acting performances at the center of Borg vs. McEnroe are both satisfying. LaBeouf is the more flashy performance of the two, and he is entertaining. He is giving one of the more grounded performances of his career. But Gudnason is equally compelling as the reserved, ritualistic Borg. There is a tension underneath the surface of his calm demeanor that is always present in his face, yet the facial performance he is giving remains completely restrained. 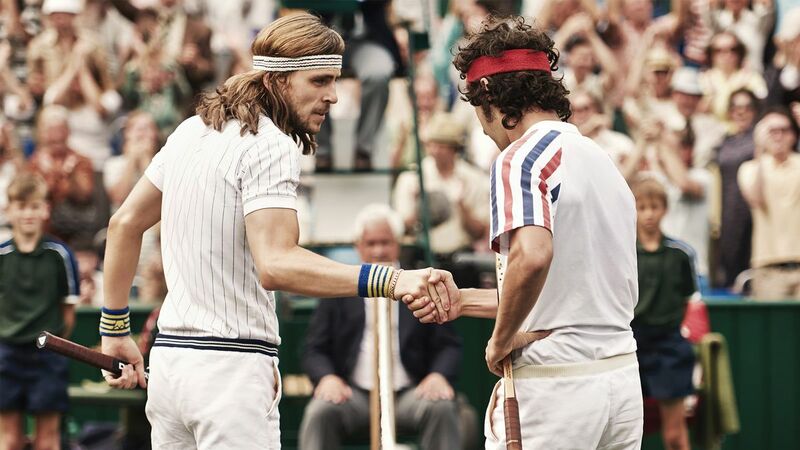 Borg vs. McEnroe may not succeed in digging completely into the mind of its titular stars, as hard as it tries to. But it does provide one of the more electrifying climaxes from a sports film in recent memory, thanks to stellar editing, direction, and performances from its two leads.